An unusual Pokemon action game for Nintendo Switch and mobile devices, set in a voxel world. Pokemon Quest is an unusual action game, inspired by such productions as Minecraft or Pokemon Rumble. In the game, you explore a voxel world called Tumblecube Isle, catch Pokemon (or rather the caricatured voxel miniatures of them) and use them in battle. The production was developed by The Pokemon Company. 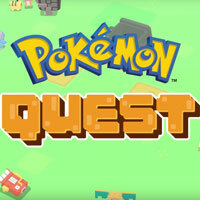 Pokemon Quest utilizes an isometric perspective. You start in your camp, which you enlarge and modify as the game progresses. Upon leaving the camp, you can freely explore Tumblecue Isle and catch the critters inhabiting it. The caught Pokemon can be used in battles against other players. The battles happen in real time, but your control over your Pokemon in combat is very limited: you can only charge an attack by pushing a button, then the creature attacks on its own. Pokemon Quest features only an online multiplayer mode. Pokemon Quest features simple 3D visuals, resembling those of Minecraft. The in-game world is colorful and pleasant, which should appeal especially to Pokemon fans. Game Guide to Pokemon Quest contains a dozen practical tips, especially useful at the beginning of the game. In our guide, you will learn how to defeat enemies and bosses, how to create a team and how to train your pocket monsters!